Obituary for Beverly A (Allison) Baxter | Boucher Funeral Home, Inc.
Beverly A. “Bev” (Allison) Baxter, 76, of Hubbardston, died peacefully Saturday, September 8, 2018 in Wachusett Manor Nursing Home of Gardner, following an illness. Born in Worcester on February 6, 1942, she was the daughter of the late Edmund and Anne (Leahy) Allison. Bev graduated from Commerce High School of Worcester with the Class of 1960. 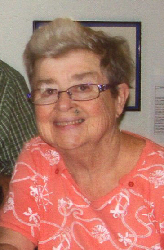 She was a Secretary for Narragansett Regional High School of Baldwinville for several years, retiring in 2006. Bev was a member of the First Congregational Church of Templeton. She enjoyed gardening and she loved walking, especially at Quabbin Reservior with her husband Dan. Bev also loved quilting, and had donated many of her handmade quilts to local hospitals. She leaves her husband of 49 years, Daniel Baxter of Hubbardston; two sisters, Shirley Armstrong of Dade City, FL and Emily Cote of Gardner; and two special nieces whom she and Dan raised, Kelly Mobley and Shawna Cote. Funeral Services will be held Friday, September 14th at 2:00 p.m. in the Boucher Funeral Home, Inc., 110 Nichols Street, Gardner. A calling hour will be held Friday, September 14th from 1:00 to 2:00 p.m. in the funeral home. Memorial contributions may be made to Gardner Animal Control Facility (checks made payable to City of Gardner Shelter Fund), c/o Board of Health, 95 Pleasant Street, Room 29, Gardner, MA 01440. Please reference in memory of Beverly Baxter.